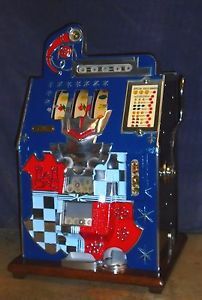 This is an antique Mills 1940’s era “High Top” Golden Nugget 5 cent slot machine in excellent condition. It was professionally restored when purchased and has just been a show piece ever since being purchased in 1981. 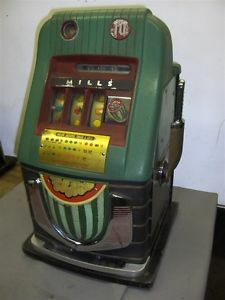 The High Top model emerged in 1947 as the new generation of post WWII Mills’ machines. It’s a one arm bandit that takes real nickels. It comes with the original keys for the front and the back, service manual, a small booklet on slots called “The facts of Slots,” and a few pamphlets/flyers of different model slots what came with the original purchase. 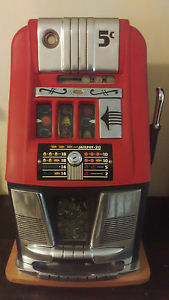 Also includes a custom cover for the machine. 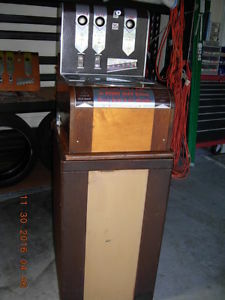 This is a great looking machine and will look really nice in your “man cave” or bar or rec-room, etc. Item is listed for local pick up but will work with out of state buyers if they arrange and take care of the shipping. Let me know if you have any questions. 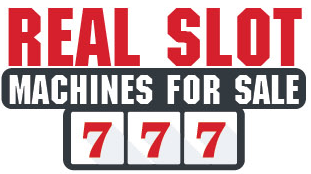 Call or text Joe at seven-one-four area code-four-eight-three-seven three-one-three. 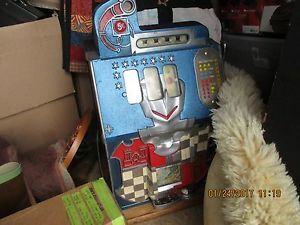 DUE TO LAWS REGULATING THE SALE OF ANTIQUE SLOT MACHINES, I CANNOT SELL THIS MACHINE TO BIDDERS FROM THE STATES OF AL., CT., HA., NE., SC. OR TN. ANY BIDS FROM THESE STATES WILL BE CANCELLED.